After the rousing success of Black Panther at the box office last weekend, fans around the world have been celebrating the fictional land of Wakanda, which has had some interesting and amusing side effects for one small town in Illinois. Wauconda, a city of more than 13,000 residents roughly an hour northwest of Chicago, has been inundated with some bizarre requests from Black Panther fans, with one person even requesting vibranium, the fictional metal native to Wakanda that is the strongest substance on Earth. Alise Hormola, the executive assistant to the village administrator and mayor, revealed that they have received a number of Black Panther-related calls and emails, although she has yet to see the film. "At first I was like, is there a full moon out? Someone called and asked how we pronounce the village name, and when I told him, he began yelling, 'Wakanda forever!' which I am guessing is from the film." This comes just a few days after Atlanta's Hartsfield-Jackson International Airport jokingly "offered flights" to Wakanda through one of its Delta Airlines gates, although there are no plans for the village of Wauconda to play up the similarity to Wakanda. Wauconda High School principal Dan Klett confirmed that the school's mascot will still remain a bulldog, despite an inquiry into changing it to, you guessed it, the Black Panther. While the town's name is spelled differently than Wakanda, that almost wasn't the case, originally. According to the Wauconda Wikipedia page, the town's traditions state that the village was named after an Indian chief named Wauconda, although his name was, reportedly, originally spelled Wakanda. The word Wauconda, translated from its original Indian language, means "Spirit Water," which is fitting since Wauconda is home to the Wauconda Bog Nature Preserve, which has been named a National Natural Landmark. 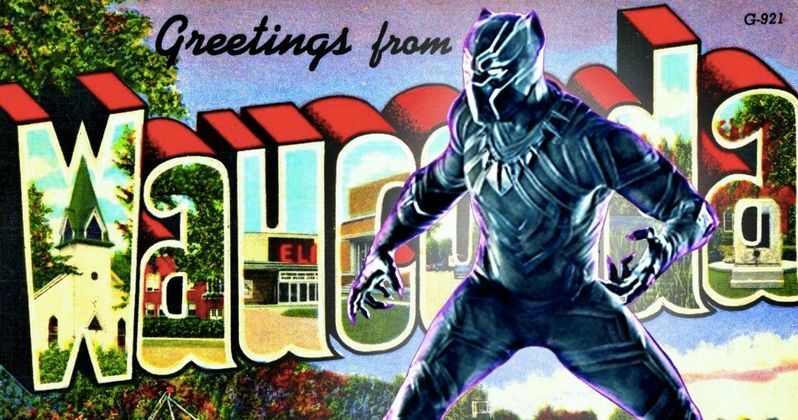 With this inadvertant "connection" to Marvel's Black Panther, and given its proximity to a major metropolitan city like Chicago, it will be interesting to see if Wauconda sees a spike in tourism. Black Panther set a number of box office records when it debuted last weekend, including the highest four-day take for the President's Day holiday weekend ($242M), with that gross also the second highest for any four-day frame, behind the first four days of Star Wars: The Force Awakens in 2015 ($288.1M). The $202M three-day tally was also the fifth highest of all time, and was the highest opening weekend tally ever for an African-American director, Ryan Coogler. The movie has also been putting up strong numbers throughout the week, with its domestic total at $277.7M and its worldwide tally at $491.3M, with the movie expected to pass $500M later today or tomorrow. There has already been talk of Black Panther 2, along with numerous spin-offs, so it's possible that the Wakanda craze for Wauconda is just getting started. While Marvel hasn't officially announced the sequel, that will happen sooner rather than later. In the meantime, you can head on over to The Hollywood Reporter for more on this Wauconda/Wakanda connection.